We've all exchanged a plateful of cookies at the holidays with a neighbor or friend. Often the cookies are placed on a colorful paper plate and covered with plastic wrap. I have a suggestion that's a cut above your typical cookie-laden paper plate. Swap out that paper plate for a nice holiday plate. Black Friday has reached our local thrift shops. Yesterday, two of my kids and I headed out to find a few things. While at the thrift shop, looky what I found! A stack of 4 beautiful holiday plates! These will be lovely, filled with home-baked cookies and tied with a silver ribbon. Our Value Village still had many holiday plates, bowls and trays. They will be snapped up in another week or two. But the idea to use a nice plate, for your cookie gifts, will still be a possibility. Many people I know use all white dishware. Plain white dishes are found in abundance at second hand stores, for about a dollar per piece, sometimes less. And plain white also happens to be a nice base for an assortment of holiday cookies. Just an alternative to your usual holiday paper plate for cookie exchanges. That will make a lovely gift to give to someone for the holidays, Lili. You could pick up similar items at yard sales throughout the year. We often run across a table dedicated to only Christmas items at yard sales. We've been decluttering here this week and went through our Christmas decorations. A couple had broken over the past year and we gave away our big tree last year, so it was something that needed doing. I even gave away some things to my nieces were here visiting this week. It sounds like you've been very busy with family around! Yes, I, too, often see a lot of Christmas-y items at yard sales. My problem is our yard sale season is mostly summer, and I never think ahead enough to pick up Christmas items then. I'll try harder this next summer, though! That's a great idea. And those are really tasteful plates too. I'm definitely going to keep a look out for festive plates, but I suspect it will be hard to match yours! keeping my fingers crossed that your special shopping spots will have something festive! Great idea! 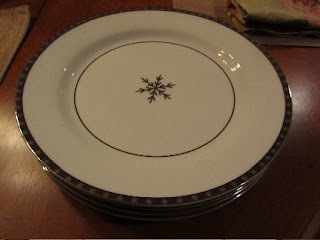 I'm going to look for holiday plates on my next trip to the thrift store! I had seen some holiday items at a different thrift store 2 weeks ago, but just didn't pay attention (was on a mission that day to find my daughter some jeans). Then seeing more holiday dishes at another thrift store, yesterday, and I realized that now was the time to buy, if I really wanted them. Good luck finding something you like! Beautiful plates and your recipient will feel very special indeed. sometimes it surprises me that someone would just give these away. But you know better than most, "one person's trash is another's treasure". And these are a treasure. I can hardly wait to bake cookies to fill them and tie up with a silver ribbon.